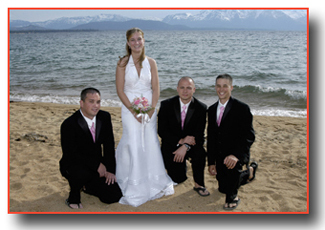 For the untailored bride and groom wanting to experience a casual wedding affair along the shoreline of gorgeous Lake Tahoe, this beachfront venue is a great spot. Your special occasion will take place near the water’s edge where the picturesque sights of the multicolored alpine lake and Sierra Nevada peaks are displayed brilliantly in the background. Being centrally located on the south shore, the venue is easily accessible with year-round availability. Since this beachfront location is not a private area, only small groups of up to ten people are able to be accommodated during the summer season. Also, chairs for guests or any type of decor cannot be setup on the beach. The optimal time for a wedding on the beach during the summertime is either mid-morning or very late afternoon. This assures the fewest number of potential beach-goers. Want a simpler package on the Beachfront?